This impressive antique Victorian English sterling silver beer/cordial jug has a plain rounded form with a cylindrical neck. The surface of this large, antique beer jug is plain and unembellished. This Victorian jug retains the original hallmarked hinged cover surmounted with an impressive pierced decorated lobed thumbpiece. 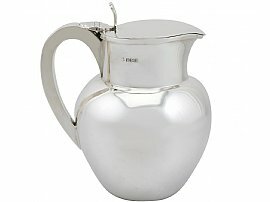 This large piece is fitted with a plain sterling silver C shaped handle. The body of this jug was made by the Sheffield silversmiths John & William F Deakin of James Deakin & Sons and the cover crafted by Henry Wilkinson; two different maker's crafting alternative components of silverware is not an uncommon practice due to the manufacturing process. This antique beer jug is an exceptional gauge of silver, exceptional quality and in excellent condition. This piece of antique silverware has been professionally polished. Full hallmarks struck to the surface of the jug and part hallmarks to the lid are very clear; the maker's mark to the jug body has wear in keeping with age and location, but remains legible. Length from back of handle to tip of spout 16.8cm/6.4"